In 1953, a momentous event occurred in Soho. London’s first proper coffee shop – one equipped with a Gaggia coffee machine – opened at 29 Frith Street. This was a place where teenagers too young for pubs could come and gather, and it is said by some that the introduction of this coffee bar prompted the youth culture explosion that soon changed social life in Britain forever. By 1972, coffee bars where everywhere and the teenage revolution was firmly established. At this time, the author of ‘Naked Lunch’, former junkie and all-round Beat legend William S Burroughs was living in London, quietly going about his business in St James’s. He lived in Dalmeny Court, Duke Street, and loved the plush gentlemen’s shops of the area, not to mention the ‘Dilly Boys‘, young make prostitutes who hustled for clients outside the Regent Palace Hotel. Although Burroughs was fond of the finer things in life – he got his shoes from John Lobb, hat from Locke’s and bought most of his food in Fortnum and Mason’s – he did at some point stumble into the Moka Bar, and was not impressed by what he found. Burroughs at this time was getting sick of London – sick of the licensing laws, sick of the crap food and small drinks, sick of the weather, the terrible service and sexual hypocrisy. He was also sick of the Moka, which he believed responsible for an ‘outrageous and unprovoked discourtesy and poisonous cheesecake’. Burroughs decided to mount a sound-and-image attack. He had previously launched one of these against the Church of Scientology, of which he had been a member, turning up at their headquarters at 37 Fitzroy Street every day, taking photographs and making sound recordings. He believed that ‘as soon as you start recording a situation and playing them back on the street, you are creating a new reality’ and that repeated exposure to such an attack would lead to ‘accidents, fires and removals’. After a few weeks, the Scientologists did indeed move, round the corner to 68 Tottenham Court Road. 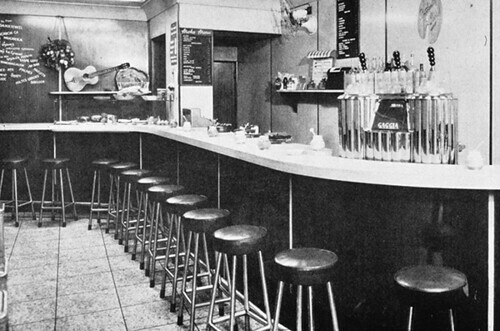 On October 30, 1972, the Moka Bar closed.